Listening to music while practicing yoga is more of a controversial idea than you might expect. For some people, it just seems to work; for others, it’s a distraction.What’s most important is to select music that you enjoy listening to and music which serves the purpose you’re trying to achieve. 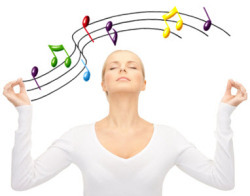 One of the most beneficial effects of almost all sorts of music is to enhance movement. When practising, some poses can feel difficult or uncomfortable, especially while a practitioner is in the earlier stages of learning yoga. Listening to music can increase the sense of grace and ease which is sought, easing transitions between postures and improving the physical benefits. Listening to music while practicing yoga can also help us to relax and not strain. Yoga is about doing our best while we relax and not comparing ourselves with others. Becoming more relaxed with music is an ideal way to do this.